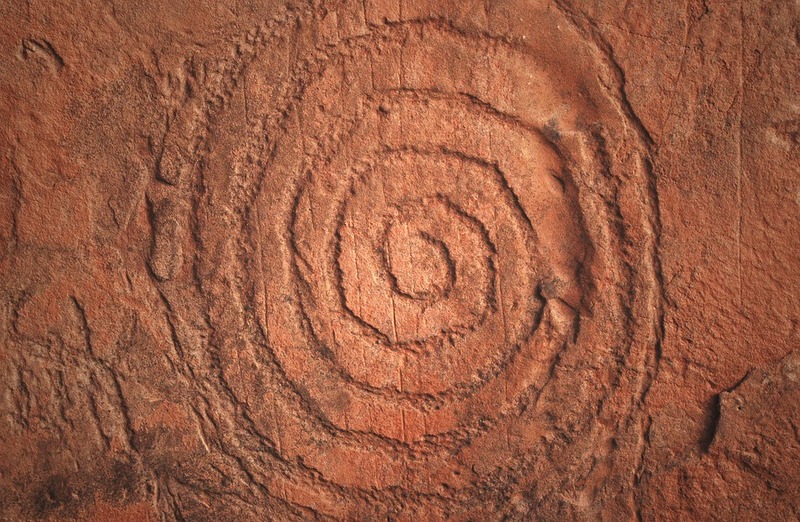 The archaeological record abounds with evidence of prehistoric cave exploration throughout the Midwest, Midsouth and Northeastern U.S. and throughout the world. 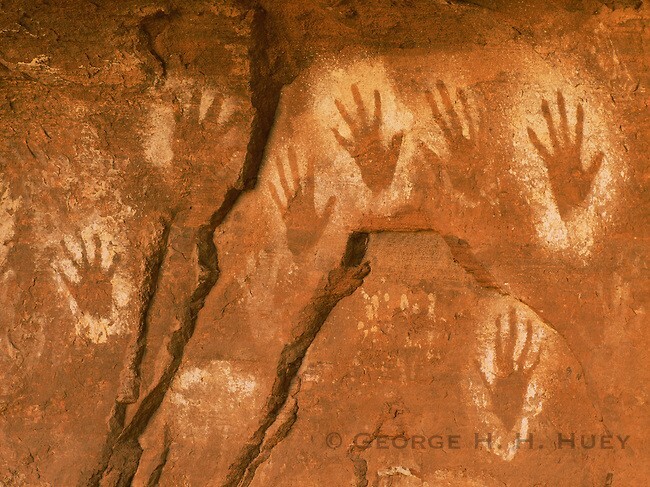 Prehistoric people have went deep into the interior of the longest cave in the world. They gathered resources and sometimes just explored. 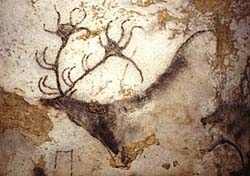 During the latter part of the prehistoric period it is apparent that some caves became sacred places where ceremonies were held. 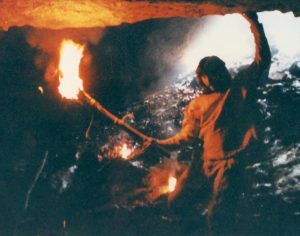 In many caves, such as Wyandotte Cave in Indiana, burned fragments of bark torches, bound with bits of cordage are found strewn along a path where chert nodules have been removed for stone tool making. 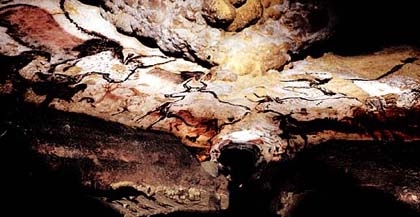 Fragments of cane torches and bark fibers that have been burned are found beside bare footprints that are said to be 3000 years old or more in Mammoth Cave. Evidence is apparent that minerals were gathered by explorers of old such as gypsum, perhaps for paint and various sulfates. In Russell Cave in Alabama two black Bear humeri bones were found. 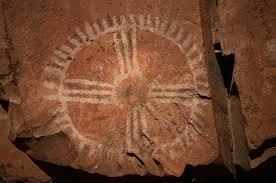 They were cut, smoothed, hollowed and polished and were obviously used as hand held torches of some type. How did ancient people light up the night or how did they conquer the rule of darkness in the cavernous depths of the earth? 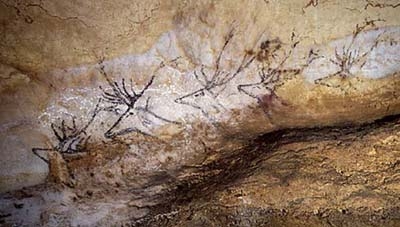 It is evident that indeed they did, for on cave walls all around the world they have left a legacy of artwork still spectacular even to this day to even the most hard-core of art critics. 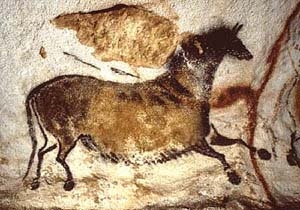 Magnificent frescoes depict a world gone by, yet never have seen the light of day. 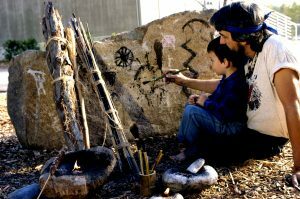 Whether exploring a cave or needing to light a trail or camp in the dark, a knowledge of primitive lighting methods is a valuable survival skill to know. 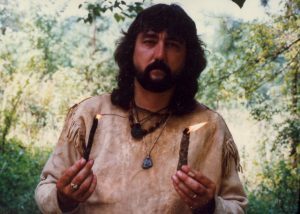 Intrigued by the possibilities of exploring yet another skill of the past I began my own experiments into ancient lighting methods, not to mention the usefulness of such a skill in a survival situation. 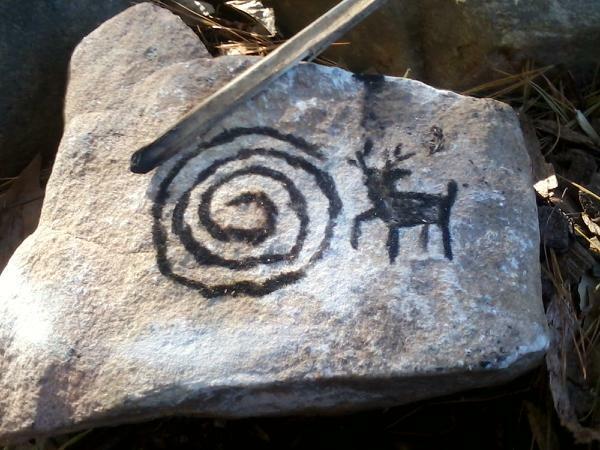 Making light, like making fire requires drawing upon a practical understanding and skill with fire. As any good firebuilder knows, you must keep a constant supply of good, dry tinder, kindling and fuel on hand to nurture a fire, if you are to keep a fire burning. It is no different when using fire for light. Lamps may be fashioned by pecking out a hollowed depression in a stone or using some natural container, such as a shell or a gourd. 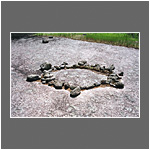 Pecking is done by striking a soft stone with a harder stone until the depression you need is achieved. 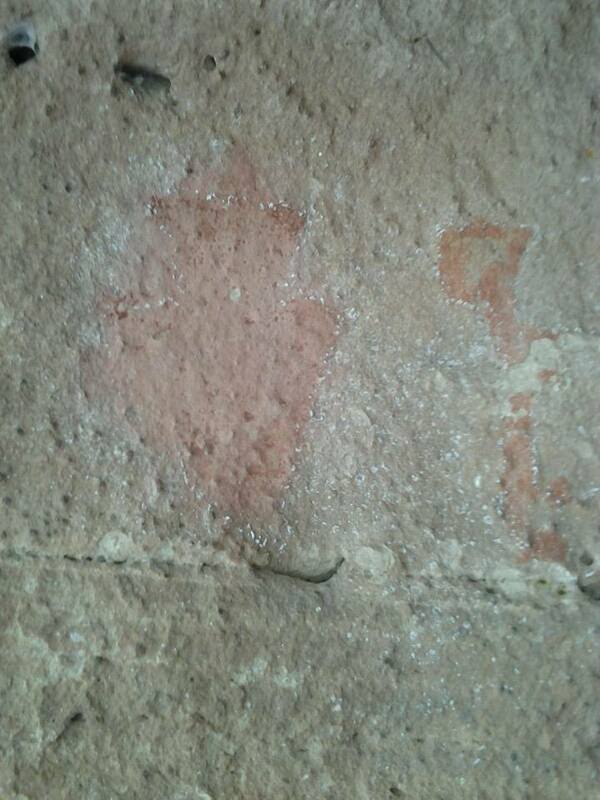 A Quartzite or Diobase pebble will usually do for a tool for pecking. 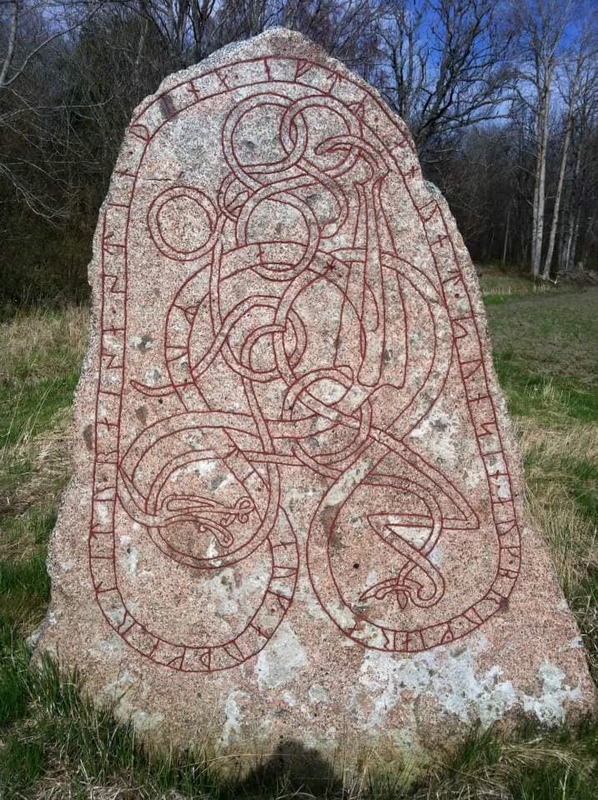 Soapstone or Steatite are probably the easiest stones to peck out a depression in. 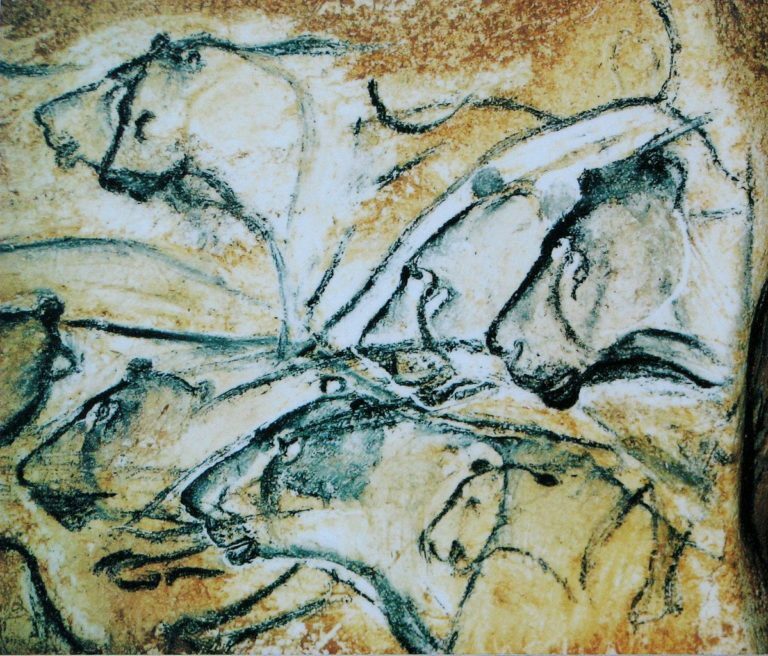 Hundreds of lamps have been excavated from Paleolithic sites in Southwest France, where some of the most spectacular cave art is found, made of limestone and sandstone. Limestone is a good choice because it conducts heat poorly, so lamps of this material don’t get hot enough to burn the user. Sandstone on the other hand conducts heat very well. 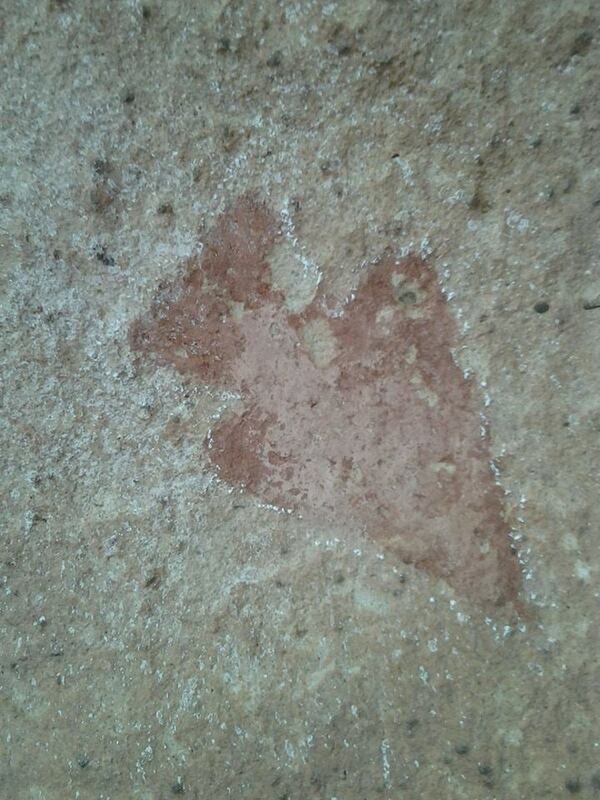 Perhaps this is why most Sandstone lamps found archaeologically have handles carved onto them. 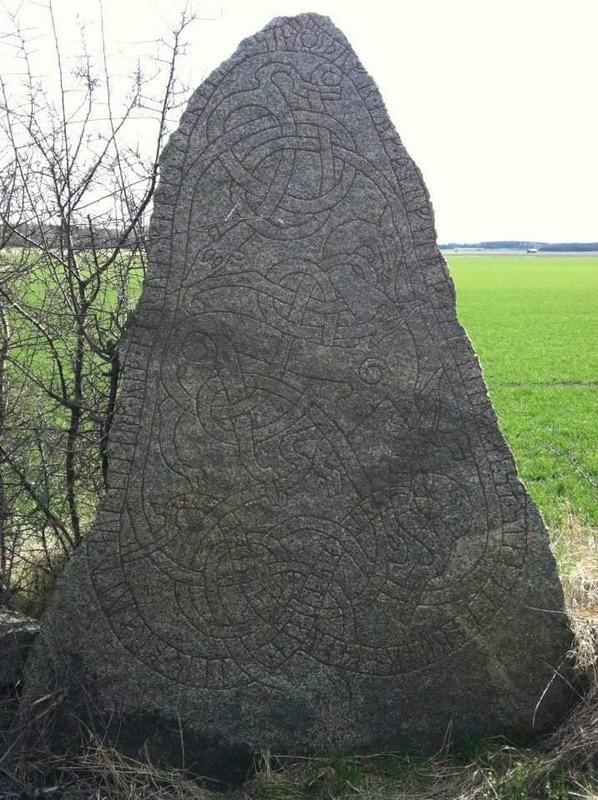 Often, a rock may be found with a natural depression. Just make sure it is a closed circuit depression that doesn’t have crevices where your fuel can run out and be wasted. Choices for basins to hold your fuel for your lamp are limitless, if you only think about what you have that can be used. I have also fashioned clay lamps and used various shells. Shells do have a tendency to break though when they get hot. There are many choices for fuels and wicks that work very well with this type of lamp. Rendered animal fats as well as vegetable oils perform very well. Vegetable oil burns much cleaner and with less smoke than animal fat. 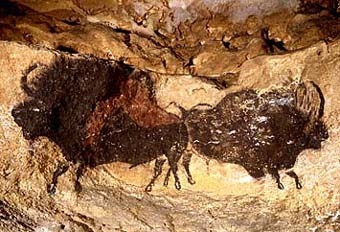 Chemical and spectrographic analysis from Paleolithic lamps examined always revealed the use of animal fats, never vegetable oils. Fat from seals, horses and cattle seemed to be used most. This makes sense, given the time period, animal fats are more easily rendered. 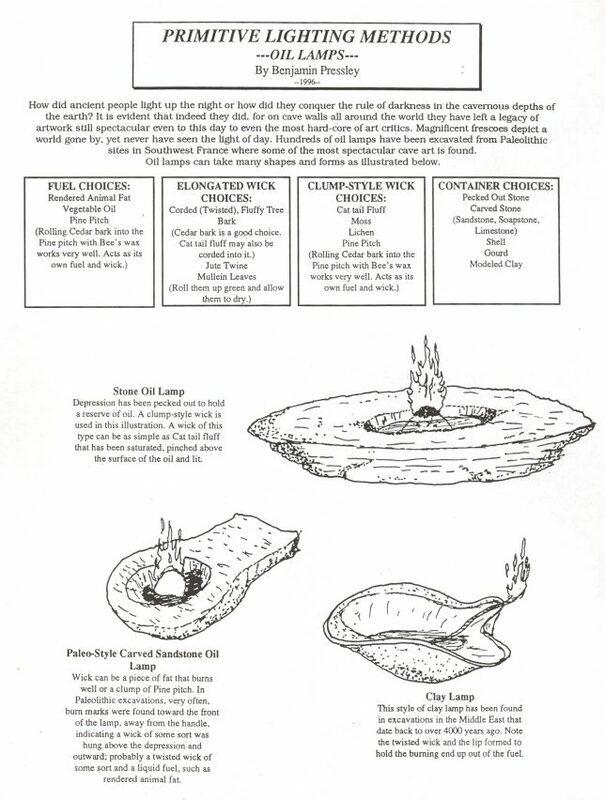 The consideration here is that the particular fat being used melt quickly and at a low temperature allowing the wick to absorb the melted fat by capillary action all the way to the burning end at a rate faster than the wick consumes itself. I find that a wick just long enough to have one end in the fuel, not coiled up in the fuel, is much more efficient, for fuel does not have as far to travel up the wick. You must also keep the flame from being drowned by excess fuel. Pecking out a slot for it to lie in while one end dangles down into the fat and the other end is lit works very well. 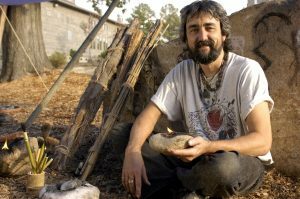 A wick may be fashioned by simply hand twisting a two-ply strand of cordage from Cedar bark you have stripped from the side of a tree, rubbed between the palms and fluffed up. If you have Cat tail down to cord in with it, all the better. Mullein leaves that have been rolled green and allowed to dry make a great wick. Jute twine also works as well as any type of corded wick. A wick may be as simple as lichen or a piece of moss that will absorb the fat as it floats. A wick that I like particularly well, that I use quite frequently, is Cat tail fluff. Steve Watts came up with this idea. Just pinch some dry Cat tail fluff off a dry, brown seed head and saturate it in the surface of the oil and light it. Works great! You can also do this with a cotton ball, some vegetable oil and a tuna fish can, if your power goes out and you haven’t got any candles. It may attract cats from miles around but you and your feline guests can eat tuna fish by candlelight! Alternatively, like the modern Inuit people still do, a piece of fat may be burned on a stone slab; fast, effective, but inefficient. I’ve even tried rolling a corded wick up in a ball of fat after saturating it. It works for a while but does not draw oil from the fat very efficiently. Rendering fat before it is used for fuel works much better. Fat may be rendered by two different methods: Frying the fat and draining off the oil before it burns up or boiling the fat in water, allowing it to cool and skimming the fat off of the top of the water. As far as light goes, generally stone, fat-burning lamps generate less light than the average candle. Larger, bulkier wicks, though, do put out more light. Pine pitch is very useful as a lighting fuel. Pine pitch is easily gathered as it oozes and solidifies on the trunk of injured Pine trees. It may also be gathered handily by cutting short lengths of River Cane, sharpen a point on the open end and leave the other end solid. Drive this gathering container under the bark of a Pine tree at an angle and into the cambium layer of the tree. You can come back at a later date with a container of useful Pine pitch. However, Pine pitch does smoke a lot and it will drip and seriously burn anyone unfortunate enough to drip any on their skin. In fact, I have even seen it burn through a leather shoe before. A stick coated on one end and built up by dipping the stick in hot, melted pitch and cooled, repeating this process till you have a ball of pitch built up on one end, much like candle making, and then lighting this mass and carrying it like a torch is NOT a good idea, for this reason. A better use for Pine pitch is mixing it in with some other fuel as a tinder to keep a fire going, whether torch or campfire. One very handy application I discovered from my early experiments is a combination of Cedar bark rolled up into a ball with fresh Pine pitch. This combination ball may then be placed in a lamp made as earlier described and is easily blown into a flame from an ember. It casts a lot of light and the compactness of the ball seems to slow down the rate of burning to the point I was getting 45 minute burns out of a golf ball sized piece. Rolling it in Cedar bark after kneading in fluffy Cedar bark also makes them not as messy to carry. These little balls are also great for fire starters under wet conditions. Adding Bee’s wax into the mixture will keep the pitch balls soft and pliable, which may serve you better, for you can then pinch off small amounts at a time. A torch I particularly like to use is a Hickory bark torch. I have seen this torch burn for as long as 2 hours. This torch is a combination of green and dry strips of hickory bark and a core of an easily combustible material that keeps a constant supply of tinder furnished to the torch. I use broom sedge for my tinder in this particular torch and bind it at various intervals, tight enough to keep it from burning up too quickly. It is lit easily with a small flame and can be blown on when more light is needed as it flares up. 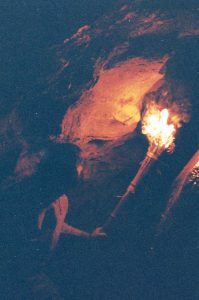 This torch performed very well for me in Langdon’s Cave, near Wyanndotte Cave in Indiana. 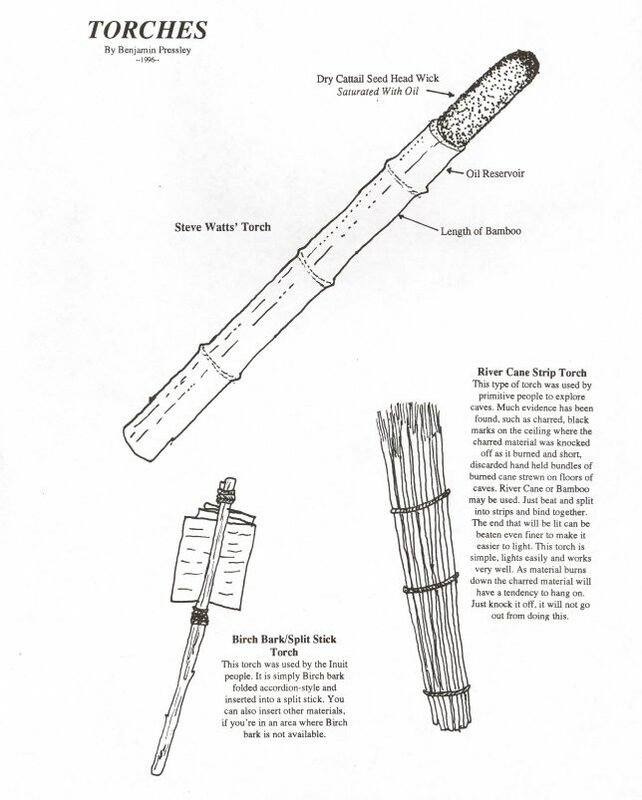 Another version of this torch can be made by using lengths of River Cane instead of bark. If wide lengths of dry bark, such as are easily obtained from removing carefully from a Birch or Poplar tree, are available, just roll up a dried length and stuff it full of the tinder. You may find that the bark of the Birch may burn fairly easily without stuffing it full of tinder. I like the extra insurance, myself. Bark may also be folded accordion style and secured in between a split green stick and tied. This type of torch is used among the far northern people as a night fishing torch. Strips of Bamboo or River Cane also work unbelievably well. To make one of these torches just bind up a bundle of Cane or Bamboo strips and light them. They require no additional tinder in the center. The tinder is the end of the torch beaten fine enough to catch up easily. 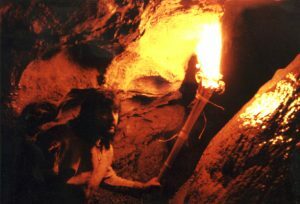 It is these type of torches that were used extensively in the prehistoric past for cave exploration for there are blackened char marks on cave ceilings where as the torch burned it was necessary to knock off the charred end. Also short bundles of burned, bundled cane are found, apparently what was left of a hand held portion of the torch as it burned down too short to be held. I have also used a mini torch made from an 8 inch section of Bamboo with another 6 inch section for a handle, open on both ends. Filling one end with melted pitch, does not work very well. When lit it will burn until it gets less than an inch below the lip of the Bamboo section and goes out, starved for oxygen. It also drips badly for all torches must be held at an angle and away from the body, to some extent. What I found that works better is to use Pine pitch that is full of pine bark fragments and heat it to the point that it is just clumpy or gather it fresh, not worrying about cleaning it out. After cutting the bamboo beat the end that will receive the pitch and bind it around the middle to keep it from splitting all the way down as you beat it. Take a stick and stuff this clumpy mixture in the beat up cavity and then further bind the section containing the pitch. This leaves ‘vents’ and when lit with a small flame burns for a length of 45 minutes or more! 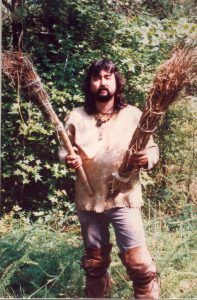 A larger version of this torch may be made using a longer length of Bamboo and using less Pine pitch and mostly some easily burning tinder like broom sedge, Grapevine or other dry barks. 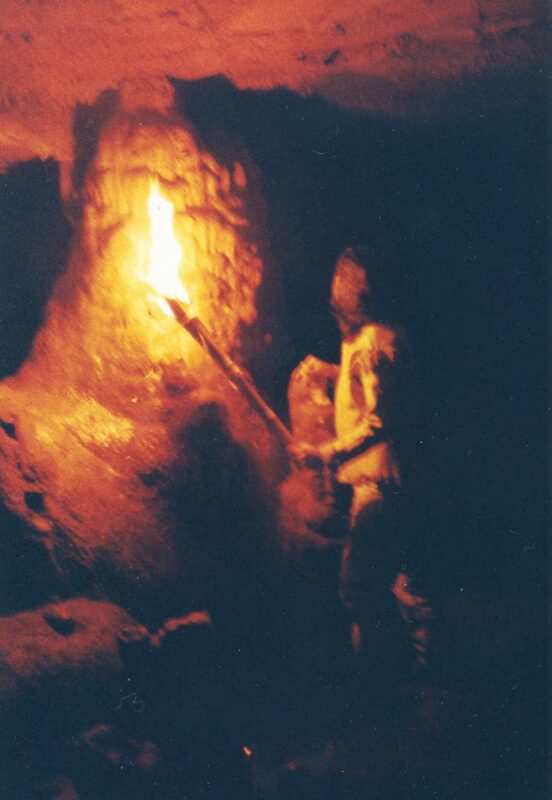 I remember exploring Langdon’s Cave with the Pine pitch mini torches, like prehistoric people of old. They left a trail of little lamps glowing behind us as if to light our way back and once when dropped in a puddle were easily re-lit by the flame from another torch, even when it was still wet! 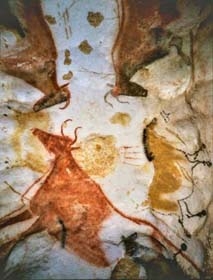 It was fascinating to explore a subterranean world lit with torches fashioned only from what nature had to offer. An adventure we all will not soon forget and will repeat in other caves. Another Bamboo torch that I really like was a design that Steve Watts came up with. A length of bamboo the length you wish to carry is cut and one end is cut as to leave an open end. A dry, Cat tail seed head is then saturated in oil. The open end of the Bamboo is then also half-filled with the same oil. The Cat tail seed head is then inserted into this end and lit. The dry Cat tail seed head acts like a wick and will draw oil from the reservoir and only partially burn itself as long as there is a reserve of oil. This torch works really well and burns safe and clean. Of course, we could get into 18th century and modern methods of candle making, but there is much already written about this subject. One need only visit the local library if one is interested in this type of candle making. 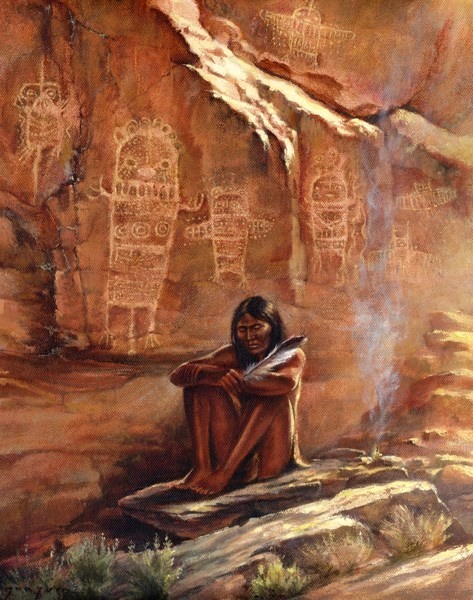 When I began my research on primitive lighting methods, I was surprised at how little there was written on the subjects of primitive lamps and torches. 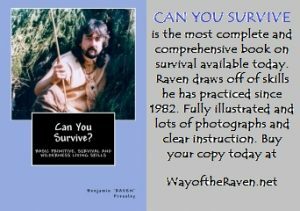 So, all that I have written is based on my own experimentation, primitive methods that one could use in a survival situation or methods that may have been used by prehistoric people. Some references are given at the end of the book. 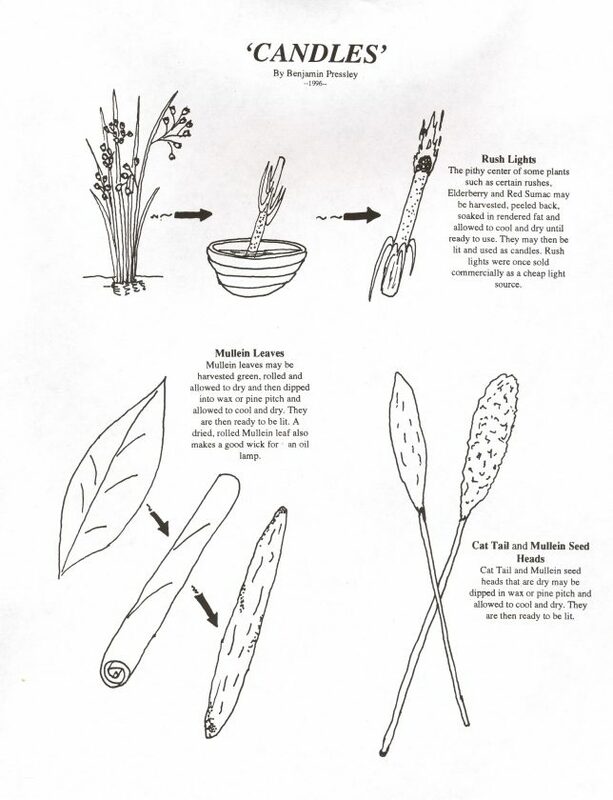 Cat Tail and Mullein seed heads perform fairly well as torches or candles when dipped in animal fat or Bee’s Wax or Paraffin, allowed to cool and when lit burn like candles of sorts. The soft, pithy core of some plants work well as wicks or as candles. Plants that work well for this purpose are Mullein, Elder and soft rush stalks. The pithy center of the soft rush was once dipped in tallow and sold commercially as cheap rush-light candles. To make one of these ‘rush-lights’, pick tall, mature stems and cut them into sections the length you wish, one foot works well. Carefully peel away the tough outer part leaving enough at one end to hold the tender pith together. Dry these stems and then immerse them in grease, melted fat or any suitable oil that does not evaporate. Set aside to cool and they are ready when you need them. A one foot length will burn for 10 -20 minutes. During Medieval times, strips of enriched pine (fat lighter) were lit and held in the mouth for light to read by. Mullein leaves also make a great candle. Just roll them while green. Allow them to dry then dip them in Bee’s wax or Pine pitch. Lay aside to cool and they are ready to light when needed. No wick in the center is necessary. As with any survival skill, take time to experiment in advance. Try out some need of these lights. Have fun with them and you will have a good working knowledge when you need it! 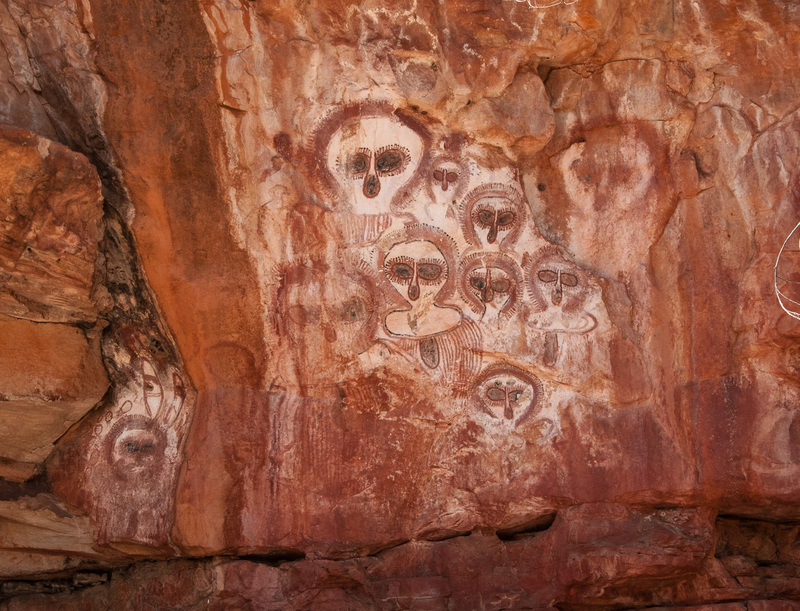 Pictographs are painted on. 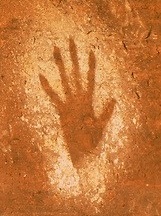 Petroglyphs are etched. 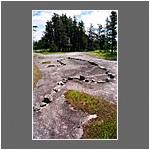 Petraforms are rocks arranged in a pattern. Enjoy this slideshow! Painting on piece of slate I painted. 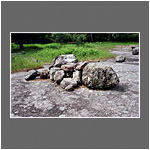 Stonehenge is an example of a petraform, rocks arranged in a pattern. 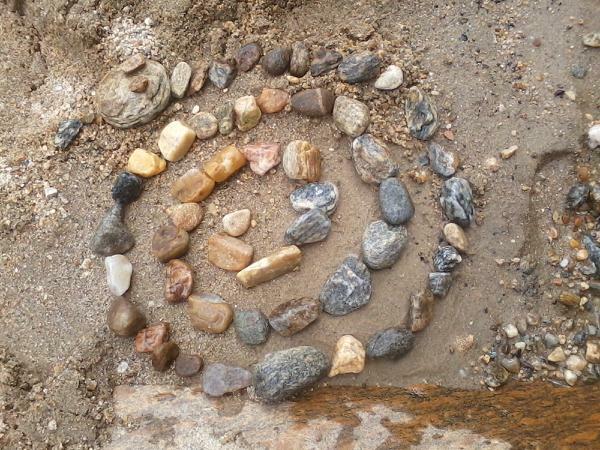 Petraform, rocks arranged in a pattern. 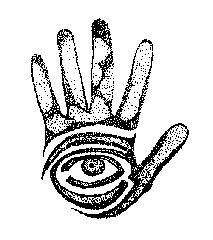 Aborigines would put paint in their mouth and blow it on their hand and cave wall and then remove it for designs like this. 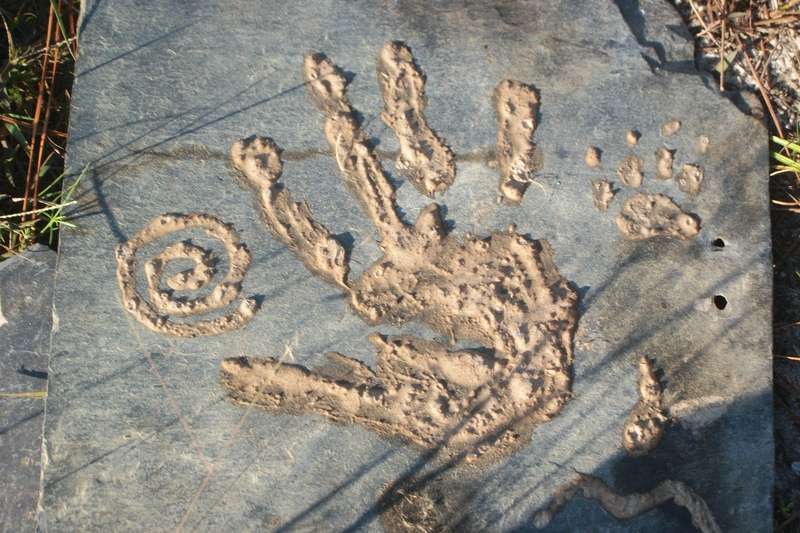 Southwest United States example of a petroglyph, both etched and painted. Beautiful etching. 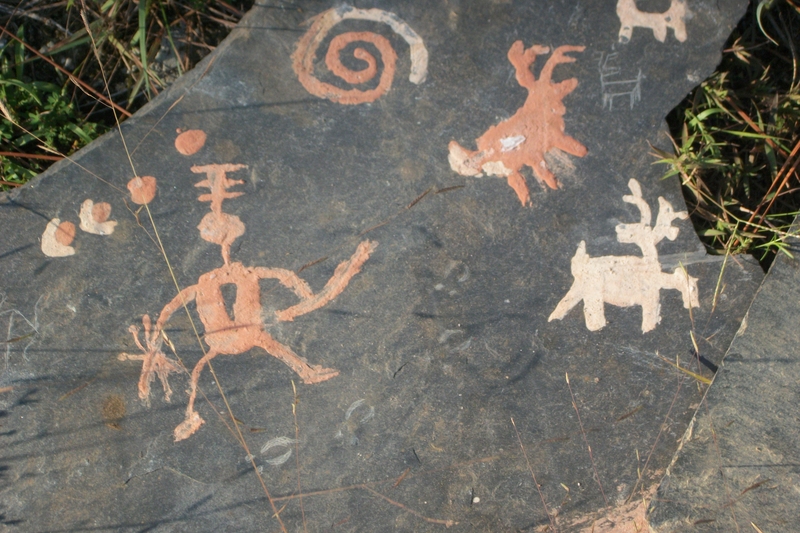 Example of a pictograph. 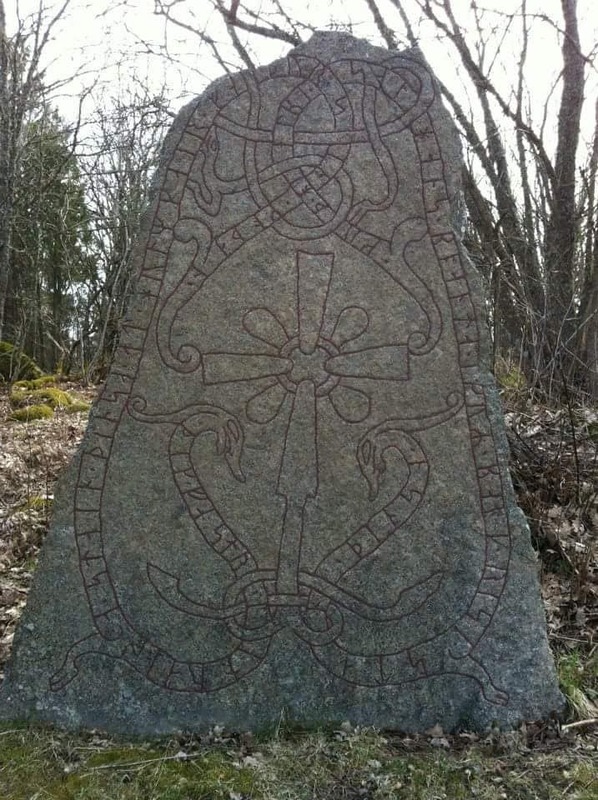 Using a burned stick I drew this design on a stone. 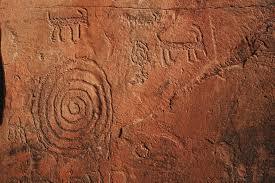 Petroglyphs like this were often sealed over with egg. 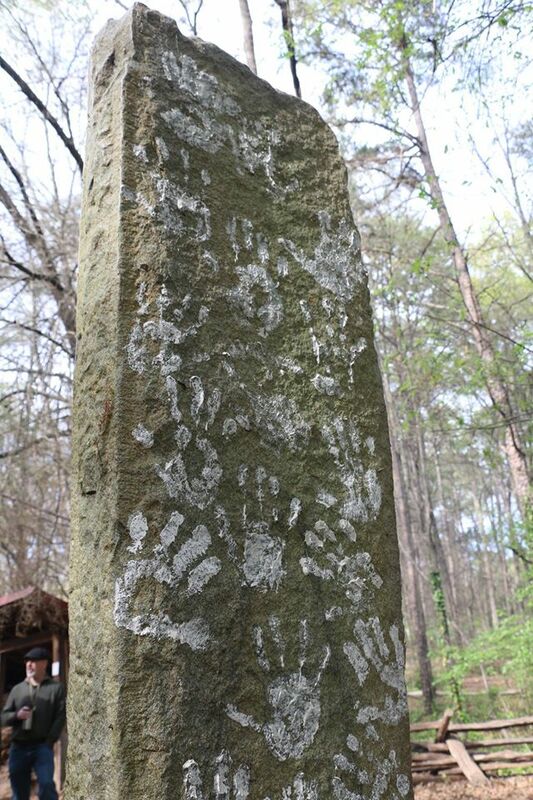 At Schiele Museum in Gastonia, NC we erected this megalith and then we all put our handprints on it. Tiny snake petraform I made under water in a mountain stream by the water's edge. It is so important to teach the next generation! Ask me about teaching your young people, school, club, scout or church group. 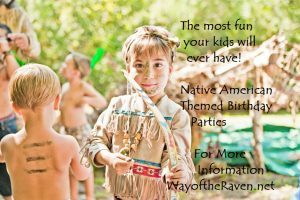 I also do birthday parties! 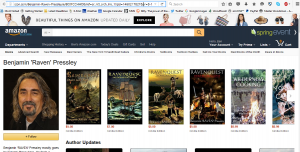 on my Amazon author website!